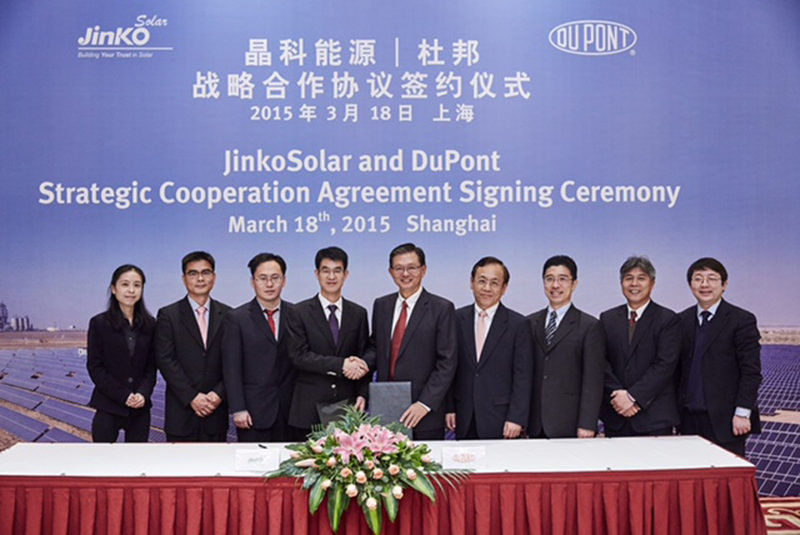 DuPont and JinkoSolar Co., Ltd. (JinkoSolar), a global leader in the solar photovoltaic (PV) industry, have signed a strategic collaboration agreement that reflects the companies’ interest in furthering the growth and adoption of efficient and reliable solar generated electricity. Areas of potential collaboration include technical development efforts to support continued improvements in the efficiency, durability and reliability of solar cells and panels, including through development and supply of advanced materials including DuPont™ Solamet® PV19x series photovoltaic metallization pastes and DuPont™ Tedlar® polyvinyl fluoride films, as well as co-marketing collaborations aimed at promoting the broader and faster adoption of solar energy to help address the world’s growing energy needs. JinkoSolar is a global leader in the solar industry. JinkoSolar distributes its solar products and sells its solutions and services to a diversified international utility, commercial and residential customer base in China, the United States, Japan, Germany, the United Kingdom, Chile, South Africa, India, Mexico, Brazil, the United Arab Emirates, Italy, Spain, France, Belgium, and other countries and regions. JinkoSolar has built a vertically integrated solar product value chain, with an integrated annual capacity of 2.5 GW for silicon ingots and wafers, 2.0 GW for solar cells, and 3.2 GW for solar modules, as of December 31, 2014. JinkoSolar also sells electricity in China and has connected approximately 500 MW of solar power projects to the grid, as of December 31, 2014. JinkoSolar has over 13,000 employees spread across its 11 global branch offices in Germany, Italy, Switzerland, the United States, Canada, Australia, Singapore, Japan, India, South Africa and Chile; 12 global sales offices in China, Spain, the United Kingdom, the United Arab Emirates, Jordan, Saudi Arabia, Egypt, Morocco, Ghana, Brazil, Costa Rica and Mexico; and four productions facilities in Jiangxi and Zhejiang Provinces, China, Portugal and South Africa. To find out more, please see: http://www.jinkosolar.com. DuPont is the leading supplier of specialty materials to the solar energy industry, with advanced materials including DuPont™ Solamet® photovoltaic metallization pastes and DuPont™ Tedlar® polyvinyl fluoride films, designed to improve the power output, reliable lifetime and return on investment for solar panels. To learn more, please visit http://photovoltaics.dupont.com. The DuPont Oval Logo, DuPont™, Solamet® and Tedlar® are registered trademarks or trademarks of DuPont or its affiliates.